Time Capsule - Could you fill 2TB? Apple will sell an updated 2TB version of its Time Capsule, with the company phasing out its 500GB version. The Time Capsule – which serves as an automatic backup unit for Mac users' data in conjunction with OS X's Time Machine – has been a popular addition to Apple's range. However, with people increasingly hungry for more storage – the need for a bigger drive is of paramount importance – and Apple has responded by offering a mammoth two terabytes of space. 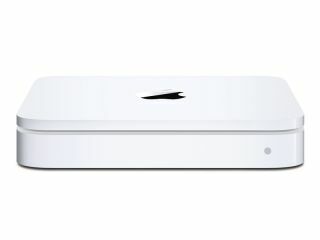 The Time Capsule is a Wi-Fi unit with simultaneous dual-band support – essentially it's the company's AirPort Express scaled up and stuffed with a meaty HDD. MacFormat's May review of the 500GB unit also points to the usefulness of pairing up your Mac with the MobileMe service, allowing you to make sure your data is safe and secure from wherever you are. There is no official news on UK pricing yet, but in the US, the 2TB version will be priced at a not insignificant $499 ( which would suggest a UK price of around £380), and the 1TB version will drop down from $499 to $299 (probably around £230).